A victorious J.B. Pritzker addressed his supporters Tuesday night after beating out Gov. Bruce Rauner in a massively expensive and bitter election. Democrat J.B. Pritzker won the race for Illinois governor Tuesday night, NBC News projected, defeating incumbent GOP Gov. 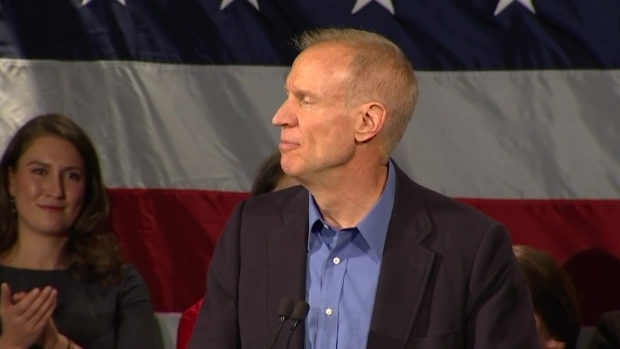 Bruce Rauner in one of the most expensive gubernatorial campaigns in U.S. history. Pritzker bested Rauner and two other candidates: Libertarian Kash Jackson and Conservative Sam McCann to win the contentious statewide race by 7:23 p.m., just minutes after polls closed. 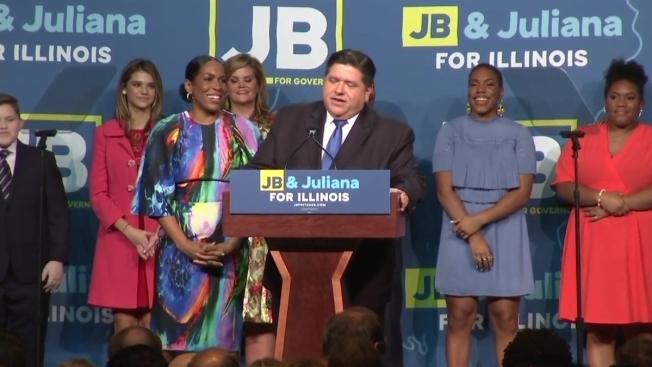 "In Illinois we have a history of building ourselves up from broken places, and the bonds we form in the process become the steel girders that hold us all together," Pritzker said during his victory speech. "I see those bonds in communities all across the state of Illinois, communities touched by both triumph and tragedy." Gov. Bruce Rauner called for an end to partisan politics Tuesday in his concession speech after losing his bid for re-election to J.B. Pritzker. Pritzker won 59 percent of the vote with 49 percent of precincts reporting as of 8:49 p.m., early results showed, in comparison with Rauner's 35 percent. McCann earned 3 percent of the vote while Jackson took home 2 percent. The quick results were in line with what many predicted, as Pritzker enjoyed frontrunner status for months with several polls throughout the race showing Pritzker maintaining a double-digit lead heading into Election Day. "Voting is an act of optimism that the levers of our Democracy still work," he said. "You embody that optimism. You light the beacon fire on the hill of history that signals from one generation to another that these are the things that we stand and fight for." Pritzker is a member of the billionaire Pritzker family, best known for owning the Hyatt hotel chain. A venture capitalist, Forbes listed Pritzker as the 219th richest person in the country in 2017, with a net worth of $3.4 billion - making him capable of self-funding his campaign. He poured more than $171.5 million of his personal fortune into his campaign beginning in 2017, more than any other self-financed candidate in the country’s history. That cash bought him a massive field operation and hours of advertising airtime to put him over the top. Pritzker’s years spent as a Democratic donor and behind-the-scenes power player also helped him earn the backing and endorsement of the party early on, including the likes of former President Barack Obama, among others. While all of that combined may have been enough to deliver him a commanding victory, his campaign was not without controversy. Rauner repeatedly attacked Pritzker on his ties to the so-called "machine," particularly incarcerated former Gov. Rod Blagojevich and House Speaker Michael Madigan. Ahead of the March primary, the Chicago Tribune published several wiretapped recordings of phone calls between Pritzker and Blagojevich, in which Pritzker discussed various political appointments with the now-incarcerated governor, both for himself and for potential African-American candidates to replace Obama in the U.S. Senate. That second conversation included some controversial comments, including Pritzker calling Secretary of State Jesse White the “least offensive” option. And just weeks before Election Day, 10 current and former Pritzker campaign staffers filed a lawsuit alleging repeated racial discrimination and harassment by the organization - claims Pritzker vehemently denied - in this cycle's version of an "October surprise." However, in a year seemingly ripe for Democrats, Pritzker was able to ride the blue wave and prevail over Rauner - who in his term ranked among the most unpopular state governors nationwide. Part of voters’ dissatisfaction with Rauner likely stems from his role in Illinois’ historic budget impasse that began in 2015 and lasted more than two years, devastating schools and social service agencies statewide and ballooning Illinois’ bill backlog to more than $14 billion. The impasse began in July 2015 when Rauner made elements of his so-called “Turnaround Agenda” – like term limits and worker’s compensation reform, among others – a condition for his signature on a state budget deal, while the Democrat-controlled legislature pushed for an increase to the state income tax to replace the previous increase that had expired at the beginning of 2015. The impasse ended in July 2017 when lawmakers overrode Rauner’s veto of their budget package, which included the tax increase. Throughout the impasse and beyond, Rauner railed against Madigan, the longest-serving state House Speaker in U.S. history who also chairs the Democratic Party of Illinois. Rauner, like many other Republicans, made Madigan his foil in the campaign, issuing another call for term limits, independently-drawn legislative maps, income tax cuts and more as main tentpoles of his platform. Another problem Rauner faced that may have contributed to his downfall was the erosion of support from his conservative Republican base. Rauner won the GOP primary by just a 3-point margin over state Rep. Jeanne Ives, who jumped into the race based on Rauner’s signing of two bills in particular that angered right-wing voters. The first was a bill to prevent law enforcement officials from detaining individuals based solely on their immigration status – which some said effectively turned Illinois into a “sanctuary state,” while the second was a measure that allows the state to cover abortions for its employees and Medicaid recipients, and will also ensure that abortion remains legal in Illinois should the landmark Roe v. Wade Supreme Court decision be overturned. Rauner attempted to earn back conservative support in the general election, most notably appearing at a Murphysboro rally with President Donald Trump, though he did not meet with the commander-in-chief nor did Trump mention Rauner by name. However, McCann still felt compelled to join the race as the Conservative Party candidate, pulling votes away from Rauner in the general election - though not by a margin significant enough to sway the results. Rauner, whose net worth is estimated to be in the hundreds of millions of dollars after a career in private equity, was another self-funding candidate in the race. He had dumped roughly $67.75 million dollars in his campaign fund since he first won in 2014, $50 million of that all at once in December 2016. In the end, that wasn’t enough to put him over the top, and in January, Pritzker will become the 43rd governor of the state of Illinois. Pritzker unsuccessfully ran for Congress in 1998, but has never before held elective office, and thus, has no legislative record. He has said that he supports raising the minimum wage, legalizing recreational marijuana, introducing a public health insurance option, increasing access to early childhood education, and more, as part of his platform. One of the centerpieces of his agenda is shifting Illinois from a flat tax to a graduated, or progressive, income tax which would tax wealthier individuals at a higher rate. Pritzker has not, however, released a detailed plan or proposed rates for what could be a politically difficult policy change that requires an amendment to the Illinois Constitution. Another issue staring Pritzker in the face as soon as he enters office will be Illinois’ unfunded pension liability - the gap between the state’s obligated payments to retirees vs. how much money the state has available to make those payments - which ranks among the worst in the country. While he again has not released specific figures behind his proposal, Pritzker has on several occasions indicated that he would support ramping up annual pension payments now in order to decrease the obligation down the road - though Rauner has claimed that could only be done through a tax increase. Perhaps one of the biggest and most underrated political showdowns in store for Pritzker’s term will be the legislative remap. The Illinois legislature is tasked with redistricting every 10 years after the U.S. Census is conducted. The last maps were approved in June 2011, which means Pritzker will be the one to sign the next maps into law. Pritzker has voiced support for allowing an independent commission to draw the map, rather than the party controlling the legislature, but Madigan is driven to protect his majority – and ultimately his speakership – at all costs. While a lot can change between now and the re-map, it will definitely be high stakes and almost certainly high drama.